Every once in a while there's a story in the news about comic books being used as a learning tool. I will always share those with you when I see them! It's always great to hear positive things in the media about comics. This week a nice article appeared in the Chicago Tribune. I was pleased to see it mention Maus and Will Eisner, and it informed me about Capote in Kansas by Ande Parks and Chris Samnee (of which you can read a five page preview over here). I wanted to display the photo that had accompanied the print version of the Tribune article because it appeared like there was a Golden Age Batman #1 and a Flash Comics #1 hanging on the school wall behind a student (but what's seen are probably just color reproductions of those covers). I was unable to find that particular photo online but I did instead find the one I'm showing up above, and it was adorning this fine article of comics-in-school from The Denver Post. Then I was only a few clicks away from finding a textbook that explains how to incorporate comic books into a school curriculum. It looks like comics are on good paper in schools these days. I'm glad about that. 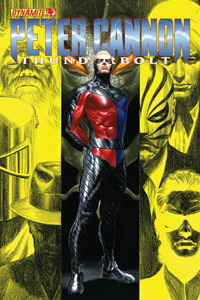 I purchased Dynamite's Peter Cannon, Thunderbolt #2 at my local comic shop. I had never gotten the first issue but I found out recently that the series is written by Steve Darnall and Alex Ross. That's right! It's the same writing team that was behind the fondly-remembered Uncle Sam prestige miniseries from DC Comics a few years back. The new Thunderbolt title features artwork by Jonathan Lau which I like quite a bit. 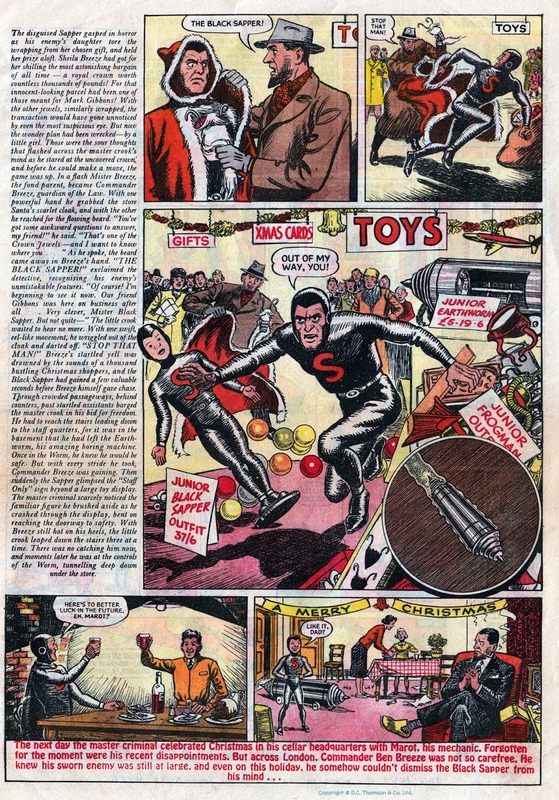 This is a series you might want to check on if you're curious whether a Charlton hero from the 1960s can find a place for himself in the comics marketplace of today. I wanted to make sure you're aware of the involvement of Mr. Ross with this comic because I feel it has not been publicized all that well. 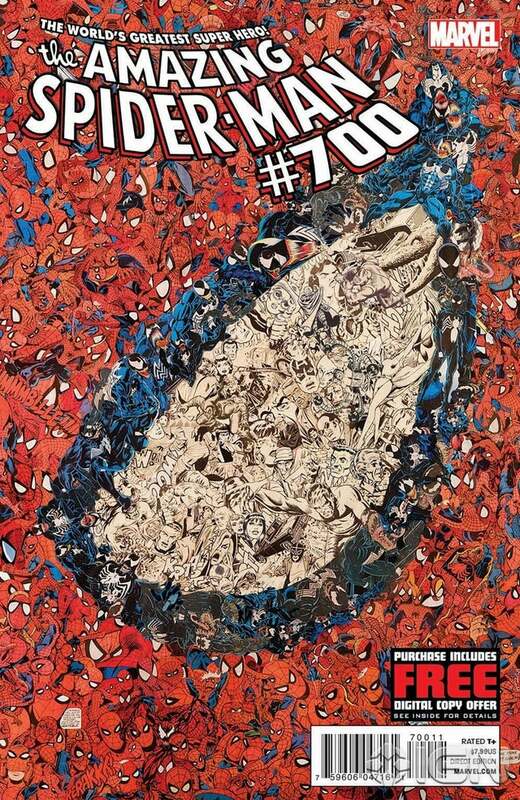 The Amazing Spider-Man #700 was released this week. I have not been following any of the Spider-Man titles for quite some time but I often pick up special landmark issues of many series to keep my toe in the various bodies of water. Here, I'll tell you what I think of ASM 700. I speak of the main cover pictured above, not of any of the six variants (all of which I like better). I find it aggravating that all of the artwork in the white-eye portion consists of photostatted old images. Probably all of the red and black portions are photostats also. Really, is this the best they could come up with? Sure, the covers of Marvel Collector's Item Classics consisted of photostats, but that was a reprint title. I hate the "#700" on the cover. The placement and sizing of the "#700" suggest that those characters are meant to fit in organically with the letters of the logo, but the zeros only barely match their surroundings while the "#" is not oriented correctly and the seven is like some kind of cruel practical joke. I hate the plot of the lead story. No spoiler warning will be needed because I'll just vaguely say that what goes on in this story would be more fitting as a one-issue What-If premise than as the "new direction" of a main Marvel Comics title. I am not on the edge of my seat and I will not be buying the Superior Spider-Man replacement title. Again I ask, is this the best they could come up with? I hate all the filler. If you're going to brag that you're publishing a 104-page comic, how about filling it with 104 pages of comics? Seven pages to reprint all the old covers? Seven pages of letters to the editor? But I did like one of the back-up stories. Date Night is beautifully drawn by Stephanie Buscema, whose work I always enjoy. I would have written a very different article today if all 104 pages had been drawn by Ms. Buscema, and I invite you to go see more of her artwork over here. Happy 90th to Stan Lee! Stan Lee has been making his mark on the comic book world since the 1940s and today the gentleman celebrates his 90th birthday. Hooray for Stan Lee! I have previously written about the 1977 Chicago Comicon where I saw Mr. Lee for the first time, and today I'd like to share with you a 24-minute 1998 radio interview with Stan the Man. The interview was heard on Chicago channel WNUA and was conducted by Friend of the Hayfamzone Charlie Meyerson (whom I introduced you to way back here). Please do read the ten things Charlie learned from Marvel Comics written by Stan Lee and then listen to the interview, both over here on Charlie's blog. 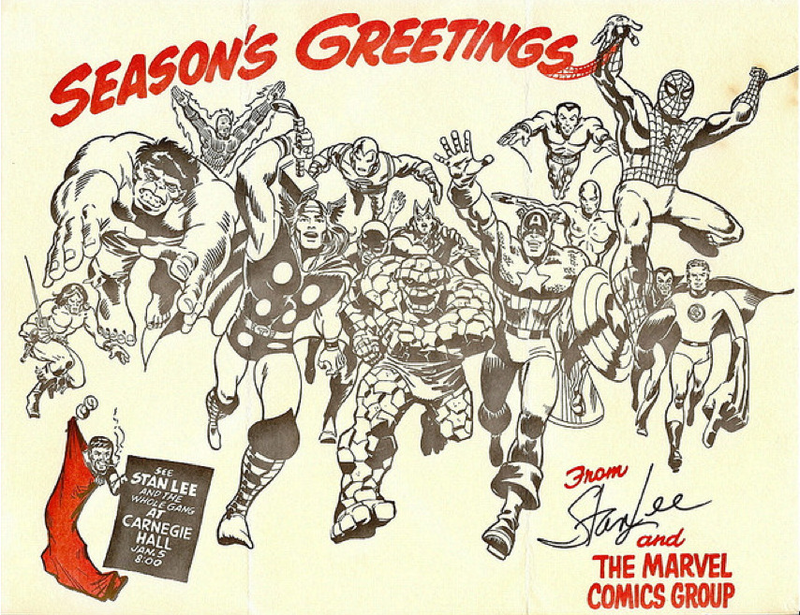 Then let's say it together 89 more times: Hooray for Stan Lee! I never noticed. But how could I have missed it? Of course I refer to the mustache. Cesar Romero was the first of three excellent live-action actors to play Batman's nemesis, The Joker. (He and Jack Nicholson and Heath Ledger were all excellent in their own different ways and I would never be able to select a favorite Joker from among them.) Mr. Romero brought quite a bit of energy to the role and all of his hooting and hamming must have hypnotized me from spotting his decidedly un-Jokerish mustache (which was concealed not a single bit by his white-face make-up). I happened upon one of his episodes last night and I couldn't see anything in the frame but that upper lip plumage of his. You can read an article (written by actress Debbie Reynolds?) about Mr. Romero and some of the other Batman TV villains over here. Stan Lee appeared at Carnegie Hall on January 5, 1972. Blogger Steven Thompson over here shares a January 2, 1972 article from The New York Sunday News touting the then-upcoming appearance and featuring an interesting interview with Mr. Lee. The above poster for the event has a history of its own, mainly due to the fact that it has been widely counterfeited. George Delmerico is the designer of the poster and he has produced a youtube video to set the record straight. You can watch that video over here. All three of these appear to have been pencilled by Marie Severin (with the one below probably inked by Frank Giacoia). 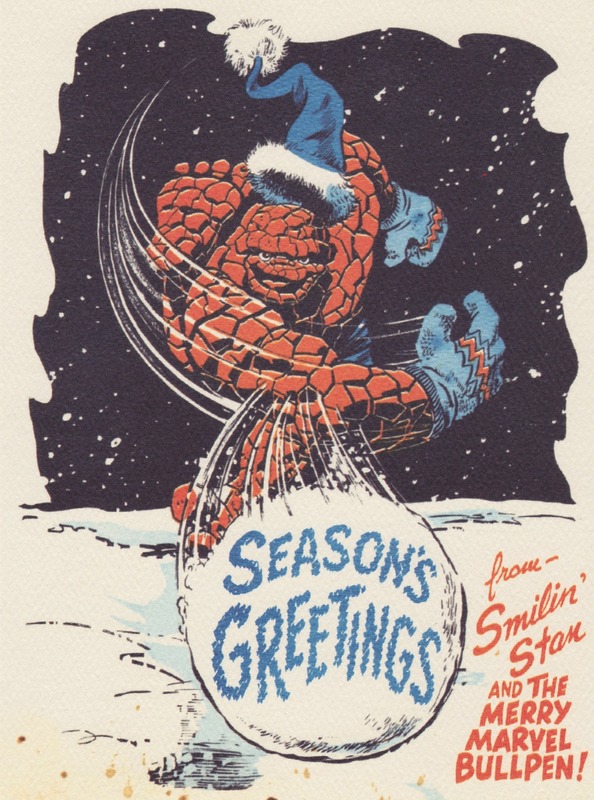 Like The Thing says, Season's Greetings! 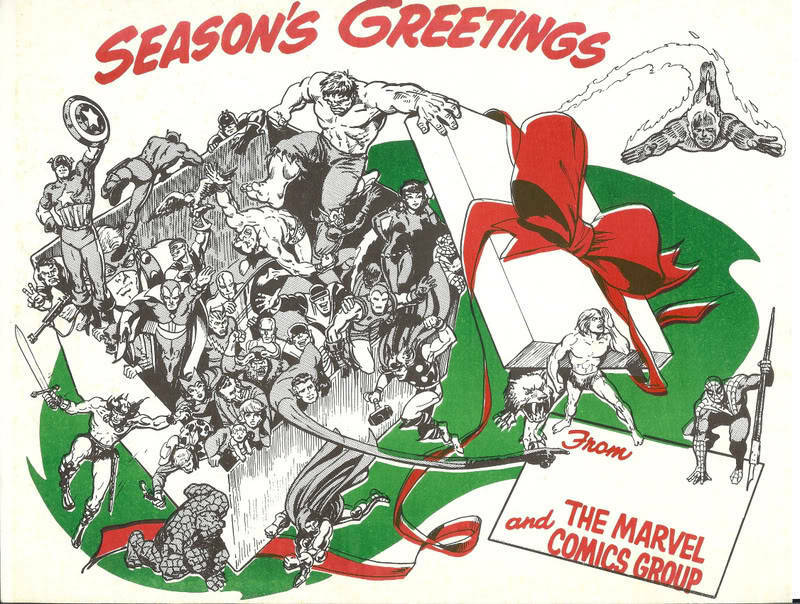 Artist and blogger Lew Stringer shares with us a dozen or so pages of Christmas comics that saw print over the decades in the United Kingdom. I had never before seen any of this artwork and I found it to be an interesting study. You can see the comics for yourself over here and maybe you'll be curious enough to visit Mr. Stringer's own art-blog over here. I recently came across a blog article by Todd Klein that I found very enlightening. Todd reports about the demeanor of the various DC Comics editors when encountered on DC office tours in the 1960s. (Shown above is editor Julius Schwartz having an early 1970s chat with Superman and Flash writer Cary Bates.) A number of the anecdotes and personal impressions I had not previously known and you may very well find the article as interesting as I did. One of the schools I teach at is Fasman Yeshiva High School in Skokie, Illinois and every year the senior class produces a taped Purim Shpiel in which they lampoon their teachers and student life in general. I have previously shown you a snippet of the production from the year 2000. A portion of this year's Shpiel imagines what one of the teachers meetings at the school looks like. "I" am played by student Yaakov Moses and, right after the camera pans past the "teacher" with the "iPad," you'll catch a glimpse of "me" reading a comic book! The video, all fifteen seconds of it, is over here. An article in an edition of USA Today this week interviewed artist Cliff Chiang about the New 52 debut of Jack Kirby's Orion. Back here I told you what a wonderful and unannounced surprise it was to see Orion lurking in the shadows a few issues ago in Wonder Woman, and it seems he will be taking center stage in the WW storyline in the coming months. I've always been quite fine with the classic Kirby design above and I don't really need the Astro-Harness to resemble an "Italian racing bike" as Mr. Chiang says it now will, but nonetheless I am very pleased that Orion and the other New Gods are returning from comics limbo. Here is the article. 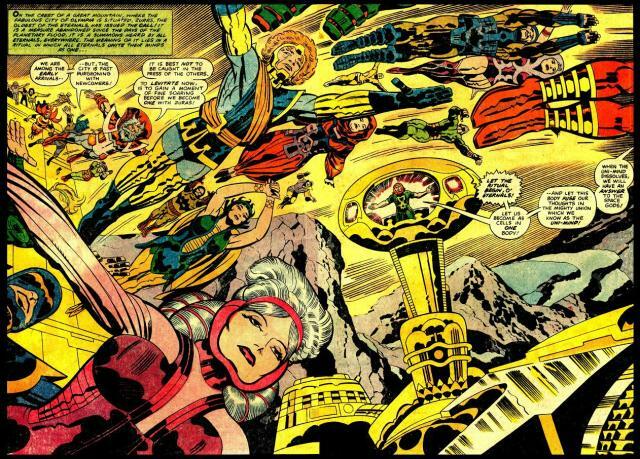 Compiled by Derek Langille, here are a huge number of double page spreads by Jack Kirby as seen in the printed comics. Those were the days! When the reality show Comic Book Men premiered in Spring 2012 on cable channel AMC, I told you a few times during its six springtime episodes how much I hated the thing.There were also six fall episodes and last week the last of those aired and, guess what? I still hate it. The series should really be classified as an UNreality show since its shenanigans bear no resemblance to the goings-on at any actual comic book store. The good news is that I have developed a new perspective that makes it less painful for me to coexist in the same universe with this dog. Just as the 1960s Mort-Weisinger-edited Superman comics relied heavily on dreams and hoaxes and imaginary stories, I've come to view Comic Book Men as a dark fantasy that takes place inside the recesses of a twisted mind. Rather than showing the true workings of a comic book shop, it presents the worst nightmares that a shop owner might have. People strolling in off the street and announcing how much they want to be paid for their collectibles? Nightmare! A birthday party for a youngster convening in the store? Ridiculous! Two of the store clerks dressing up and re-enacting the wedding of Reed and Sue Richards? So stupid! But now at least I can wink at the wry satire of it all. I get the joke and it doesn't make me as frantic. I have learned to stop worrying and love the bomb.. Though my new viewpoint allows me to tolerate the television show's existence, please don't misread this as me wishing success for it. I still hate the thing. My fingers and everything else I have at least two of were crossed that the fall finale of Comic Book Men would in fact be the series finale.Imagine how my souffle dropped when an announcement was made at the end of last week's installment that the show will return in the spring with new episodes. Now that's what I call a nightmare. Steve Niles has posted this Bernie Wrightson page from an unpublished Spirit story that Mr. Niles wrote for the First Wave initiative at DC Comics a couple of years back. I find the artwork very interesting and thought that you might also. 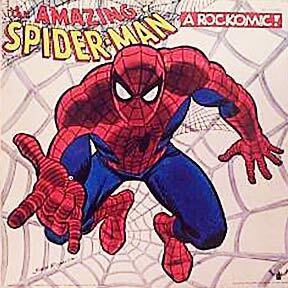 Spider-Man: From Beyond the Grave is an excellent long-playing vinyl record. Released in 1972 by Buddah (or maybe you prefer Buddha) Records, it features actors in a fairly well written play that is punctuated by fun pop songs that still strike me as catchy forty years after I first heard them. I was strolling through a shopping mall one day in 1972 and borrowed $4 from my older brother to buy this record which (of course) I still own. I liked what I heard from the very first listen! I also liked what I saw, because the record jacket folds open to show rows of wordless comic panels drawn by the great John Romita and which follow along with the story on the record. I just learned today in my research that Peter Parker/Spider-Man was portrayed by Rene Auberjonois (whom I would get to know decades later for his roles on Star Trek and Boston Legal) and the songs were sung by Ron Dante of The Archies! You can purchase this recording as an MP3 on Amazon over here, but that option strikes me as inferior to owning the original album whose availability you can check on ebay over here. If you'd like to taste the milk without buying the cow, you're really going to like what blogger Phillyradiogeek has put together for you over here. The packaging suggested that From Beyond the Grave was to be the first in a series of Rockomics, but there was never another. I wish there had been. Every day The Hayfamzone Blog receives one or two comments. Unfortunately, 97% of the time the comments are SPAM! Back in this article I told you how I believe that the boots Mike Sekowsky drew on members of the Justice League look like the Ugg boots of today, and (I'm not kidding here) many of the spam comments I receive are advertisements for Ugg boots! I delete all those spam comments so Hfz will not look like a garbage dump, but I never delete real and substantive comments. I welcome non-automated comments and encourage you to send me one any time you strongly agree or (especially) disagree with something I've written. 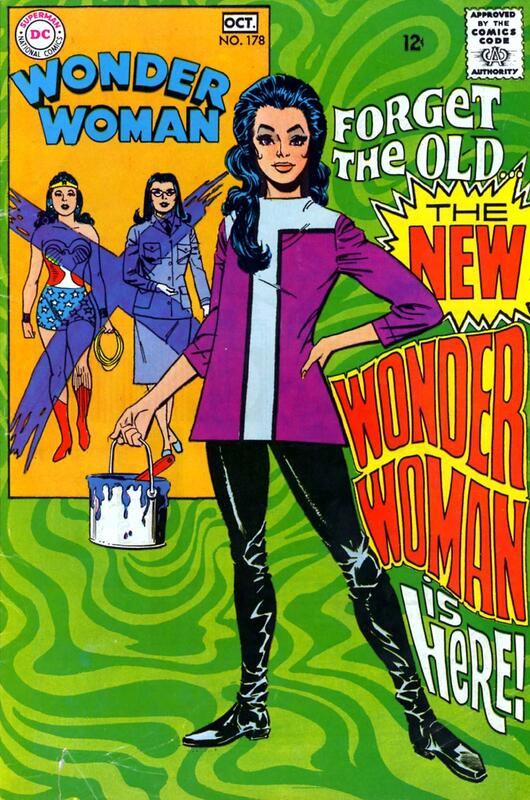 By the way, do you suppose Mr. Sekowsky in the above photo was having that young lady model for his drawing below of Wonder Woman? When the Rima the Jungle Girl series came out from DC Comics in the 1970s, I was spellbound by Nestor Redondo's lush and exotic artwork. Everything Mr. Redondo drew was great, of course, but his style seemed more natural on this title than on Swamp Thing. I was not as entranced a couple of years ago by the New Wave version of the Rima character, but I did very much like the Rags Morales artwork that introduced her to us. I just learned this week that there was a proposal to give New Wave Rima a comic book of her own but it didn't get past the planning stages. Over on his blog, writer Brian Wood tells about this and a few other unproduced series that he pitched to DC Comics over the years. Have some fun and take a look at 62 funny animal superhero drawings by Jamie Cosley right over here, and then I bet you'll want to investigate Jamie's website. Here is a letter written recently by Steve Ditko in response to one of his inquisitive fans. Very interesting, don't you think? I was a huge fan of 3-D comic books from the first minute I ever saw one. Probably my introduction was the 1960s 3-D Batman and then I backed up to the Batman issue and the Superman issue from the 1950s and then the 3-D world opened up to me with Joe Kubert's Tor and EC 3-D and Captain 3-D by Jack Kirby (in collaboration with Joe Simon and Steve Ditko and Ben Oda) and so many others. The 3-D comics experienced a massive comeback in the 1980s and I did my best to grab every title that was released. (I had been thinking that that 3-D Gumby (of which there were SEVEN issues!) had an Art Adams cover, but I see now that I was confusing it with Gumby comics published by Comico.) It seemed like every one of the class of the 80s had the byline of "3-D by Ray Zone." Could that be his real name, I wondered? I knew that Mr. Zone had rejuvenated 3-D comics for a new generation but I did not realize until this year that he had improved the 3-D processing! I learned this in a recent obituary for the gentleman. The anecdote is that Ray Zone showed Joe Kubert his simplification of the 3-D technique and Mr. Kubert was astounded at how much Mr. Zone had streamlined the process. 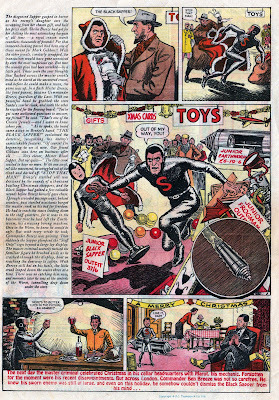 Here is an article that has Mr. Kubert reminiscing about the old 3-D comics (and did you know that Mr. K's 1950s partner Norman Maurer was married to the daughter of The Three Stooges' Moe Howard?). Here is another Kubert 3-D article with clear reproductions of a couple of Tor pages, and here is a blog from which you can download the contents of Captain 3-D #1. And, lastly, here is an artful photo of Mr. Ray Zone himself, whom we hereby honor with a hayfamzone salute. Thatababy by Paul Trap caught my eye in the comics section of last weekend's newspaper. 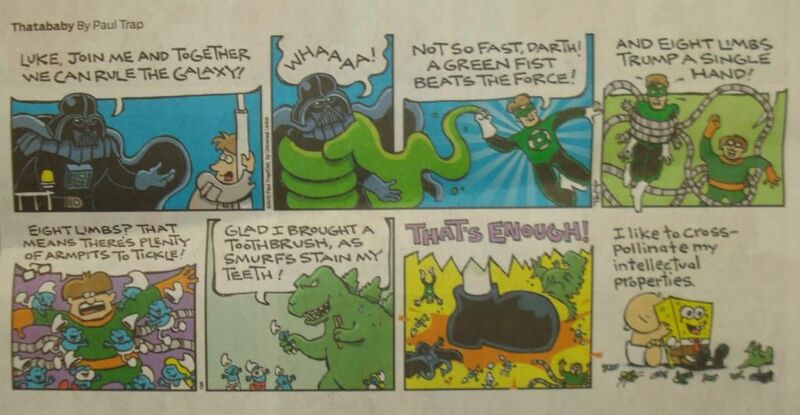 Yes, that's Darth Vader versus Green Lantern versus Dr. Octopus versus Godzilla. You can view a larger image over here. Ken Jennings spoke on the radio yesterday morning and I learned that he has a connection to comic books! He mentioned that he is a big comics fan and owns a couple of boxfuls. I've written previously about how Len Wein's wife Christine Valada had a winning run on Jeopardy, but Ken Jennings' 6-month 75-episode streak as Jeopardy champion about a decade ago is unsurpassed. He revitalized interest in the show for many viewers and he is my favorite Jeopardy player of all time (with Frank Spangenburg being my second favorite). 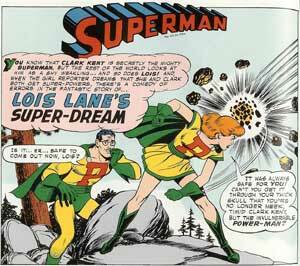 I did a little digging and found a blog post by Ken Jennings in which he wrote knowingly about Curt Swan's and Mort Weisnger's involvement with Superman, and you can read it for yourself over here. That page also exhibits the other three panels of the Ken-Jennings-as-Superhero comic strip that I am displaying one panel of. In Fantastic 4 comics in France, Human Torch says "Filet mignon!" instead of "Flame on!" and the Thing is called the Je Ne Sais Quoi.